"Zanu-PF has never complained, not even once. Which team have you seen that plays a game without complaining, not even once to an impartial referee? It's therefore clear that they are not players in this game and that the referee has picked a side," he said ahead of today's demonstration. 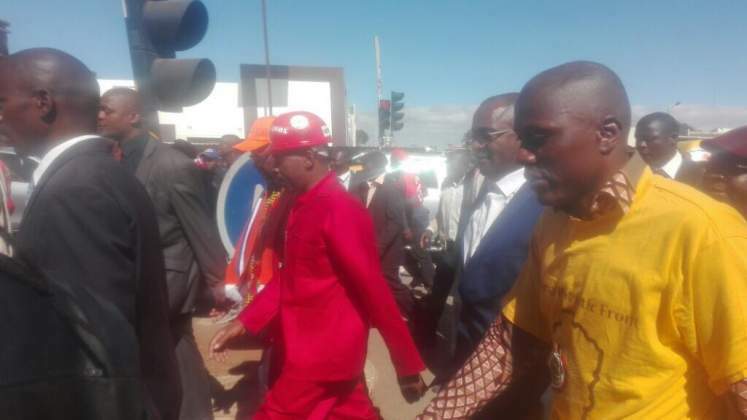 Chamisa said he would also demand from Zec chairperson Justice Priscilla Chigumba to explain how Zanu-PF managed to get hold of the database under its control. In a joint statement yesterday, the MDC Alliance, Joice Mujuru's People's Rainbow Coalition, Elton Mangoma's Coalition of Democrats, the Alliance for People's Agenda (Nkosana Moyo), Build Zimbabwe and MDC-T led by Thokozani Khupe agreed Justice Chigumba's team had failed its mandate and had lost public trust for a free and fair election. "Zec has refused to avail the biometric voters' roll as required by law. It has, so far, distributed an incredible electronic voters' roll with astonishing manipulations and irregularities that range from same identity cards on different faces, same identity cards for different people, many people on addresses that don't exist, too many people on one address, too old people that can't still be alive, candidates nominated, but not appearing on voters' roll," the parties said. According to the parties, Zec seems to have been distributing "many different rolls" for this election. "No one can be sure what version will be used on voting day. One version had a duly nominated candidate missing. The candidate was given another version in which their name now appeared," the parties said. But Zanu-PF deputy secretary for legal affairs Paul Mangwana said: "We are on the ground addressing people who will vote. Only the MDC believes that an ‘X' can magically move from one place to the other, we don't win elections by magic." "Tomorrow (today), if [President Emmerson] Mnangagwa and Chigumba don't want to give us a clean election, we will go straight to the State House," Chibaya warned. "On November 18, we joined forces with soldiers after we were asked by war veterans to remove Mugabe. Now we are saying Mnangagwa and Zanu-PF must go. Our demonstration is just a highlight that we are not going to allow these people to steal elections," he said.